Democratic socialism is a political ideology advocating a democratic political system alongside a socialist economic system. 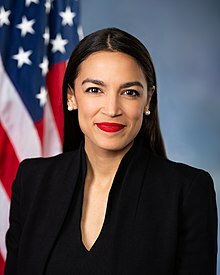 Trump’s dig on socialism means he’s scared, Ocasio-Cortez said... What really scares the pro-plutocrats on both sides of the political aisle about her, [Bernie] Sanders and other democratic socialists is that they have become messengers for a compelling message with an actual vision — the simple idea that it’s up to government to intervene and equalize the playing field between the capital that owns the politicians, the system and the rewards, and the general public toiling to provide those rewards. Democratic Socialism is not a middle way between capitalism and Communism. If it were merely that, it would be doomed to failure from the start. It cannot live by borrowed vitality. Its driving power must derive from its own principles and the energy released by them. It is based on the conviction that free men can use free institutions to solve the social and economic problems of the day, if they are given the chance to do so. [You cannot] inject the principles of ethical Socialism into an economy based upon private greed. Aneurin Bevan, Speech, Blackpool, 29 November 1959. Quoted in Stuart Thomson, The Dictionary of Labour Quotations, Biteback Publishing, 2013. The new politics will no longer be molded by the ‘isms’ of capitalism or socialism, but created from self-respect in individuals and nations... Capitalism, in its pure form, is at an end in Europe. It has no future whatsoever. Instead, countries will model their governments on a form of democratic socialism. How can the rights of the individual be protected and therewith a democratic counterweight to the power of bureaucracy be assured? Clarity about the aims and problems of socialism is of greatest significance in our age of transition. Democratic socialism traces its origin to a moral revolt against the inhuman dictatorship which nineteenth century capitalism imposed upon our people, and it has rejected with no less vigour in this century another form of inhuman dictatorship into which Marxism was tragically distorted. Michael Foot, in Gerald Kaufman, Renewal: Labour's Britain in the 1980s (1983), also quoted in Stuart Thomson, The Dictionary of Labour Quotations, Biteback Publishing, 2013. To me, you know, to answer your question, the definition of Democratic Socialism, to me, again, is the fact that in a modern, moral and wealthy society, no American should be too poor to live. And to me that means every working class American in this country should have access to dignified health care, should actually be able to go see a doctor without going broke. It means you should be able to send your kids to college and trade school if they so choose. And no person should feel precarious or unstable in their access to housing as our economy develops. Alexandria Ocasio-Cortez, Interview, "Meet the Press", NBC, July 1 2018. Quoted in "Alexandria Ocasio-Cortez: "Socialist" Is "Part Of What I Am, It's Not All Of What I Am" RealClearPolitics ,July 1, 2018. A socialist is someone who wants politicians to decide who gets what; a “democratic socialist” wants the politicians to at least stand for election first. Let us begin by a definition of Socialism. The definition must consist of two parts, economic and political. The economic part consists in State ownership of ultimate economic power, which involves, as a minimum, land and minerals, capital, banking, credit and foreign trade. The political part requires that the ultimate political power should be democratic. Bertrand Russell, "The Case for Socialism", in In Praise Of Idleness, 1935. ...what of the many governments in the developing world that still call themselves socialist, particularly one-party states? In many ways, one-party Communist states have shared more in common with past authoritarian capitalist “developmentalist” states — such as late nineteenth-century Prussia and Japan, and postwar South Korea and Taiwan — than with the vision of democratic socialism. These governments prioritized state-led industrialization over democratic rights, particularly those of an independent labor movement. Joseph M. Schwartz, "Is Socialism Undemocratic? ", Jacobin magazine, 22nd March 2016. I shall not stir multitudes, but may persuade my readers when I say that democratic socialism, not sure of all answers, not promising sudden utopias, is the world's best hope. Norman Thomas, Socialism Re-Examined, 1963. There’s nothing less Democratic than socialism, which always gives rise to tyranny. Make socialists and you will achieve socialism; there is no other way. Democratic socialism is the only possible sane and living socialism. The only possible socialistic state is a state which is understood, upheld, willingly and cheerfully lived, by the great mass of the people. H. G. Wells, "The Faults of the Fabian", (1906), reprinted in Samuel Hynes, The Edwardian Turn of Mind, Random House, 2011.